In this case the background is the foreground. Enveloping the gallery walls, the canvases have expanded its importance from containing and presenting the images to becoming the main feature of the show. 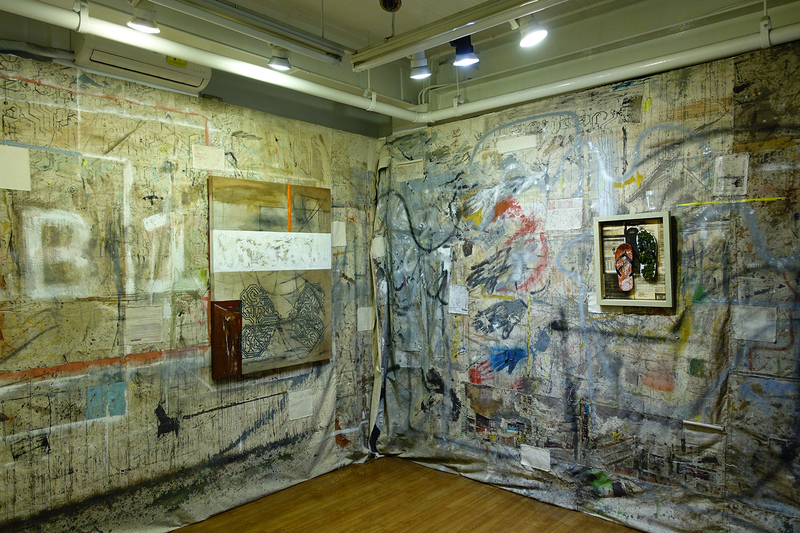 The unprimed canvases in the exhibition once lined the floors of the artist’s transient studios to avoid leaving traces of paint stains behind. The carpet-canvases caught colour excesses that did not make it to his final abstracted expressions. A sense of regard for the spaces the artist has occupied in his early years in New York was the rationale for employing the canvases. He brought these with him, going from one borough to another, travelling to where a job opportunity or an artistic grant takes him. 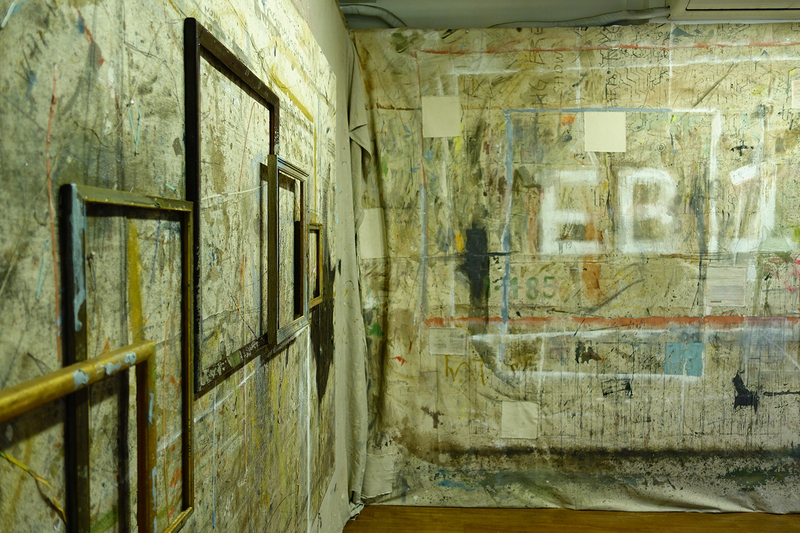 The blocks of canvas had been tacked together resembling the process of quilting, which has a long tradition in America, to cover the areas of the center and right walls measuring at 8’ x 12’ and 8’ x 11’ respectively. 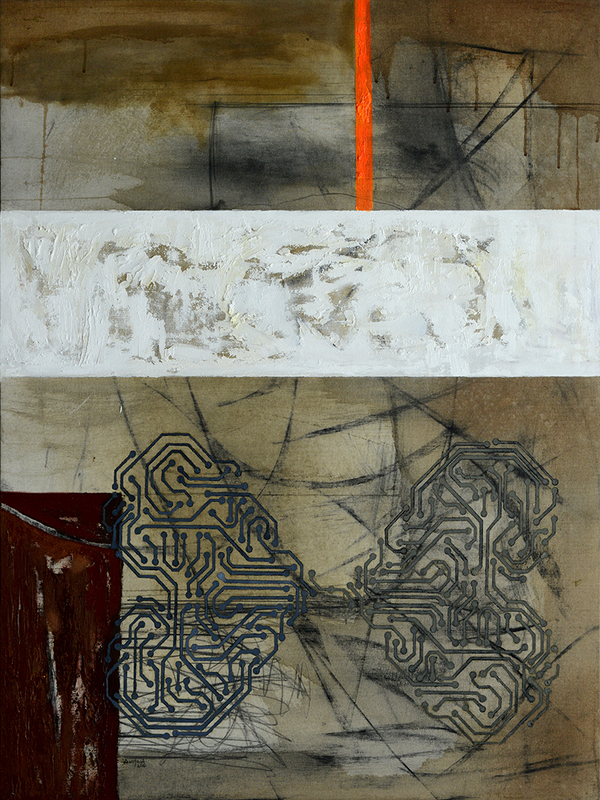 The middle canvas is titled EB-1 and the one on the right is O-1. The attachment on EB-1 carries the name, The Seeker. 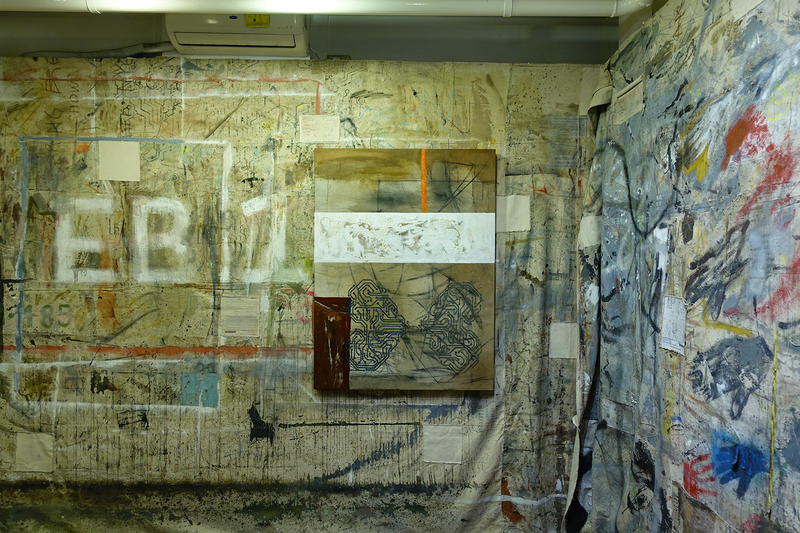 A set of discarded frames, arranged horizontally across a stretch of canvas, is the focal point on the left called The Handler. 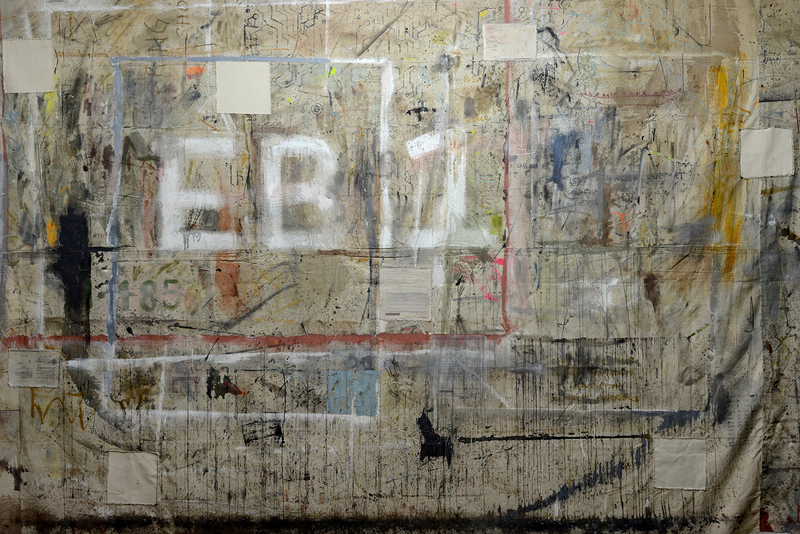 The artist further added patches of unused canvas on EB-1 as a break from the surrounding color ruptures. The same technique was applied on O-1. This time however all the patchworks had photo transfers of the artist’s passport pages and portions of communication from the immigration office. The patches are pauses that fall few and far between on the busy rhythm of his life in the city where people clock in 10 to 12 hours of work a day. In The Handler, the six frames previously held works of the old masters in an auction house where the artist is currently working as an art handler. He draws a similarity, to a lesser extent, between his job and that of an OFW who cares for infants, the elderly, or an entire family in a foreign land while leaving her own family behind in the Philippines. The artist devotes majority of his time taking care of other artists’ works at the auction house while he schedules studio work for his own art on those rare patches. This, however, is not unique to the artist. It is a common plight of many art makers around the world – balancing work that addresses the food-clothing-shelter needs of the body on one hand and work that longs to be expressed from the soul and spirit on the other. 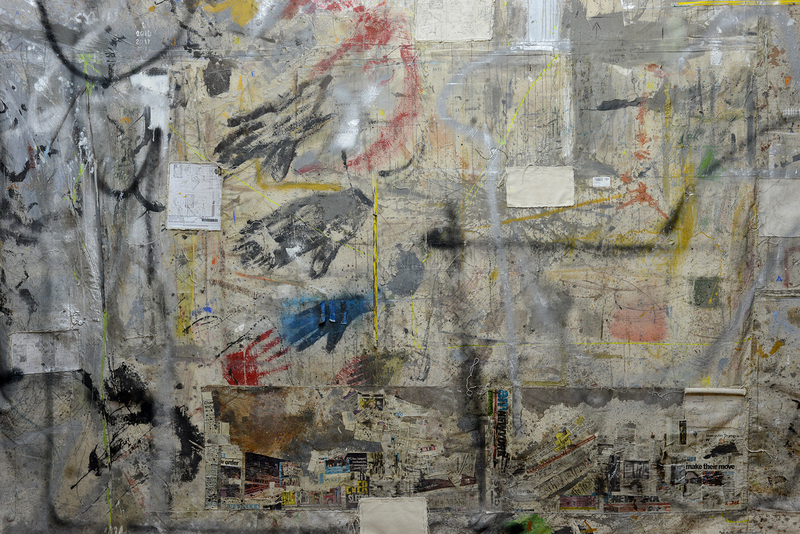 On the surface of the canvases, the paints have settled well with the accumulated dusts, grimes, and creases caused by the wear and tear of handling and the transatlantic flight. Beyond the surface, the canvases bear secrets and back stories as they witnessed the creative process of the artist. 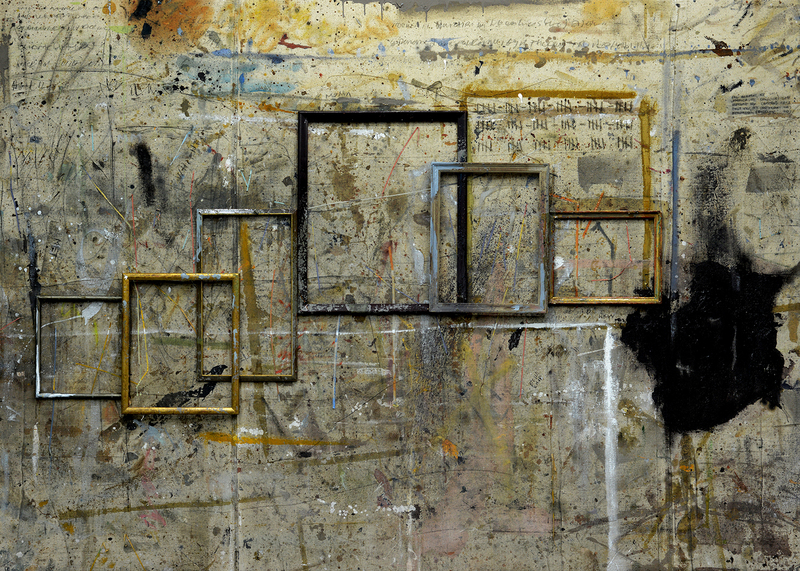 Every spill of pigment, blot of ink, and handprint, or the thirty-day count, reminders, show titles, and numbers that the sturdy canvases had ably preserved served as an accidental abstract documentation of his artistic journey in the city. 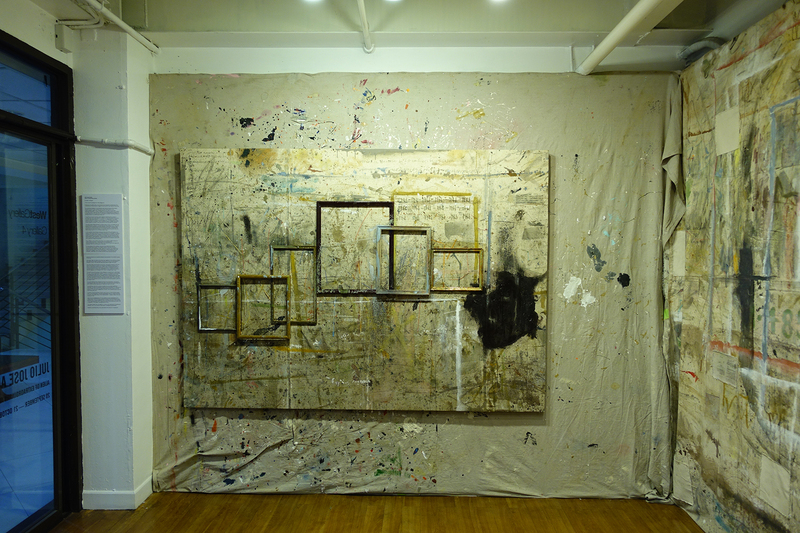 One winter night, the idea for the show came together for the artist as he stared and stared at the strewn canvases on the floor this time at his own studio in Brooklyn in 2014. The idea was finally articulated on paper mid-2016. The artist knows documentation all too well, having gone through his files and share of law offices to produce the necessary requirements to qualify as an Alien of Extraordinary Ability back in 2010. Alien of Extraordinary Ability is a priority visa issued by the United States government to foreigners who have provided proofs for at least three requirements on the criteria list for either of the two categories: non-immigrant (O-1) visa or immigrant (EB-1) visa. 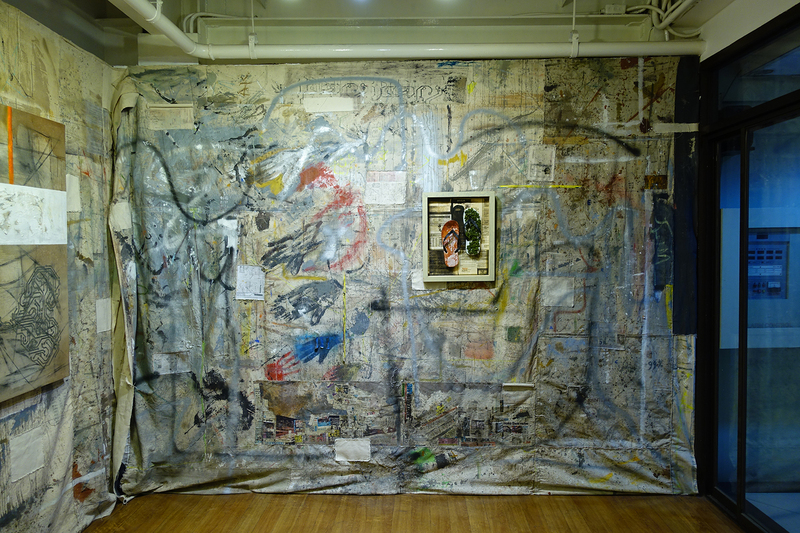 The artist honors the process he had undergone to acquire the O-1 then finally the EB-1, as a first generation migrant in the US, by naming his first exhibition of installed works after which. Prior to applying for the artist’s visa, he met undocumented artists who had to abandon their art making because they could not avail of the opportunities open to those who were documented. They were in a survival mode loop to meet the food-clothing-shelter basics. He did not want this for his own experience since it was clear to him that he wanted to push his art further in NYC. The artist therefore went through the motion of documentation, and found it refreshing that other artists from other parts of the world had to go through the same evidence-producing process to make their case for the visa. The exhibition, the first in a series, deviates from the artist’s abstracted paintings. He likes the challenge of exploring the new whether it’s a new form or a new territory. But he has not really made America home just yet. This year, because of his solo show engagements, he was in the Philippines twice from his usual once-a-year trip. A mentor in the city pointed out that a part of him is in the US while another part is in the Philippines. The artist acknowledges that he is neither fully here nor there. He accepts being in this middle ground – a state of limbo of his own making, for now. 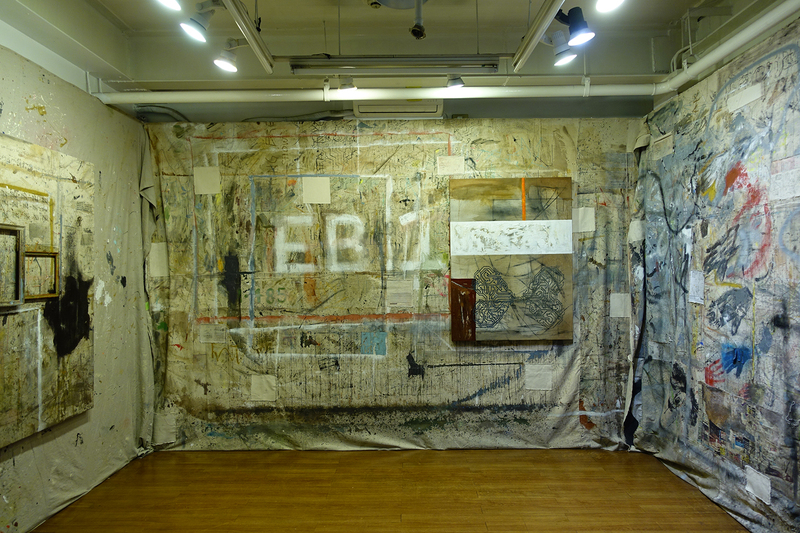 Apart from the backgrounds of (1) the creative process represented by the canvas blocks, and (2) the documentation process for the visa covered by the exhibition title, another background that is coming to the fore in this exhibition is the underlying search which started the artist’s entire American journey. This is depicted in The Seeker, the attachment on EB-1. The Seeker breaks from the safety of a comfort zone searching for something or someone, and in the process of that search undergoes transformation. 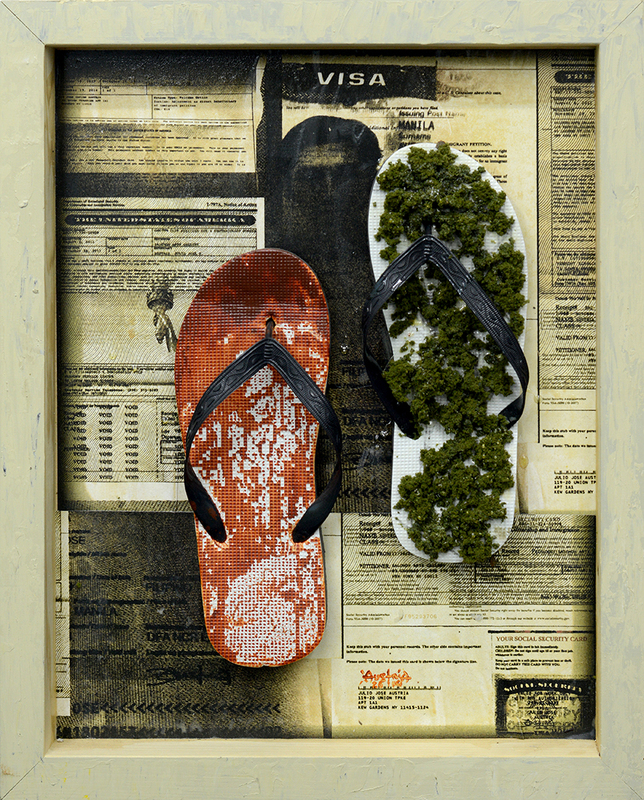 Hopefully, exhibiting artist Julio Jose Austria finds what he is looking for.